Springsteen attends the third Annual Rock & Roll Hall Of Fame ceremonies with Bob Dylan, The Beatles and The Beach Boys the evening's key Hall Of Fame inductees. This 1988 event is considered to be the most memorable to date due to the number of major stars that turned up. Bruce gives the induction speech for Dylan. 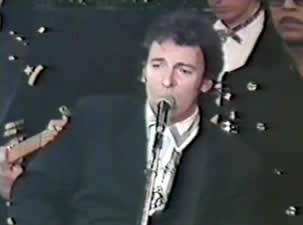 Springsteen performed in varying musician/vocalist support roles. Bruce attended the event with then-wife Julianne Phillips - it was the last time they were seen in public together. The group singing backup on most of the songs, credited on the aforementioned compilation as The Rock Hall Jam Band, includes, among others, Ben E. King, Johnny Moore, Joe Blunt, Clyde Brown, Jeff Beck, George Harrison, Mick Jagger, John and Tom Fogerty, Billy Joel, Bob Dylan, Les Paul, Mary Wilson, Elton John, Arlo Guthrie, Yoko Ono, Ringo Starr, The Beach Boys, Little Richard, Peter Wolf, Neil Young, Paul Simon, Dave Edmunds, Jeff Lynne, Julian Lennon, Sean Lennon, and The World's Most Dangerous Band. 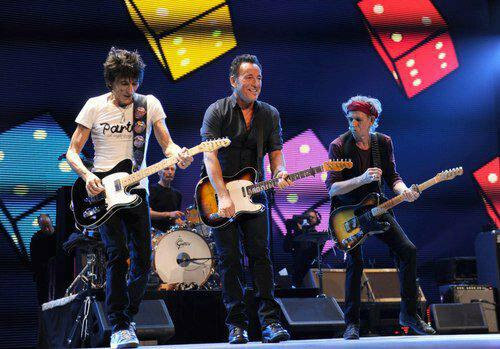 Also on stage are various E-Streeters, including Max Weinberg, Little Steven, Clarence Clemons, and Patti Scialfa. Joel sings lead on "I Saw Her Standing There". Fogerty sings lead on "Born On The Bayou". 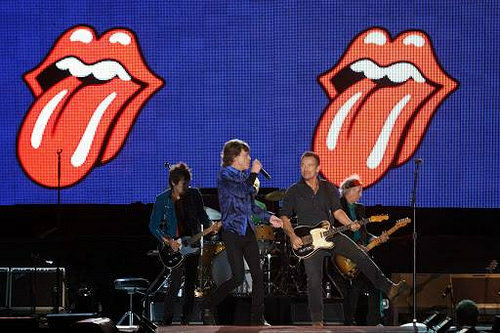 Jagger sings lead on "(I Can't Get No) Satisfaction", calling Bruce over to share the microphone. 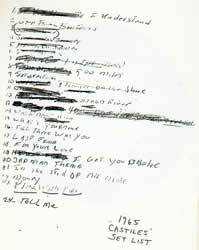 Dylan sings lead on "Like A Rolling Stone", and Harrison and Dylan share vocals on "All Along The Watchtower". "(I Can't Get No) Satisfaction", featuring the fan who requested it joining in on tambourine. "(I Can't Get No) Satisfaction" is a song by the Rolling Stones, released in 1965. It was written by Mick Jagger and Keith Richards and produced by Andrew Loog Oldham. Richards' three-note guitar riff—‌intended to be replaced by horns—‌opens and drives the song. The lyrics refer to sexual frustration and commercialism. The song was first released as a single in the United States in June 1965 and was also featured on the American version of the Rolling Stones' fourth studio album, Out of Our Heads, released that July. 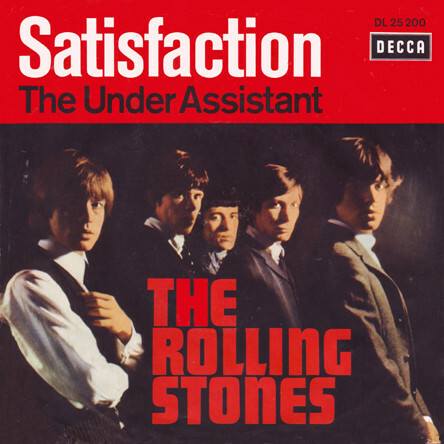 "Satisfaction" was a hit, giving the Stones their first number one in the US. In the UK, the song initially was played only on pirate radio stations, because its lyrics were considered too sexually suggestive. Can't you see I'm on a losing streak?